Open water in Arctic Ocean affecting weather patterns around world. A new international report shows that Arctic temperatures are rising higher and faster than expected, and the effects are already being felt around the world. 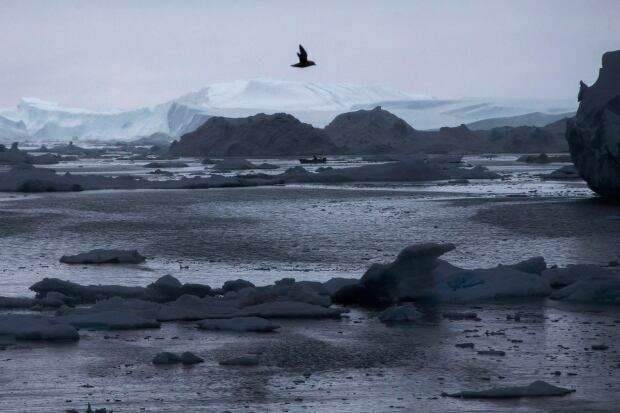 “The Arctic’s climate is shifting to a new state,” warns the report. The Snow, Water, Ice and Permafrost in the Arctic assessment was written by more than 90 scientists from around the world who compiled the latest northern research on how climate change is affecting the Arctic ice and ecosystems. It’s part of the Arctic Monitoring and Assessment Program of the Arctic Council, which represents eight circumpolar countries. The Arctic Ocean could be largely free of sea ice in the summer as early as 2030 or even before that. Arctic temperatures are rising twice as fast as the temperatures in the rest of the world. In the fall of 2016 mean temperatures were six degrees higher than average. Thawing permafrost that holds 50 per cent of the world’s carbon is already affecting northern infrastructure and could release significant amounts of methane into the atmosphere. Polar bears, walruses and seals that rely on ice for survival are facing increased stress and disruption. Changes in the Arctic may be affecting weather as far away as Southeast Asia. “The Arctic is connected to the rest of the planet,” said David Barber, who is a leading expert on Arctic ice at the University of Manitoba and one of the authors of the report. “We are seeing the first and strongest signs of global warming in the Arctic. We knew this was coming, we knew 30 years ago that it was coming, and it is now here,” said Barber in an interview with CBC News. Barber said one of the most surprising results of the research is that there is now open water even during the winter in the Arctic Ocean. “We didn’t think we would see that much open water in the winter,” he said adding that it is occurring mostly on the Atlantic side. Last year saw a record low amount of winter sea ice. That open water may be affecting weather patterns. Increased heat from the open water is rising into the atmosphere, which in turn is causing the polar vortex, also known as the jet stream, to weaken in strength. The jet stream is the line of powerful winds between the cold dry air of the North Pole and the warm moist air mass farther south. As it weakens, it disintegrates into a series of lobes dipping up and down, carrying cold air south and warm air north. Scientists believe that’s the reason why we are seeing unseasonably frigid temperatures in places like Florida and unusually warm weather in the north. “For example, last fall in November-December, the temperature at the North Pole was 32 degrees Fahrenheit higher than it should have been in November-December, because one of these lobes had extended all the way to the North Pole and was drawing up warm weather from California,” said Barber. The report says the weakened jet stream is also causing extreme weather events like heavy rain in North America and heavy monsoons in Southeast Asia. Amid the dire predictions, the report contains some hope. It says that while these changes in the Arctic will continue until 2050, they can be slowed down after that. It predicts that if governments make substantial cuts to greenhouse gas emissions, like those contained in the Paris climate agreement, it can help to stabilize the warming trends in the Arctic and stop further loss of ice and snow by the end of the century. This report is being released ahead of the Arctic Council meeting in Fairbanks, Alaska, on May 11. The U.S. is hosting the meeting, which will be the first time that Arctic nations including the U.S., Canada, Russia, Denmark, Finland, Iceland, Norway and Sweden will gather to talk about climate change since Donald Trump was elected U.S. president. Trump has called climate change a Chinese hoax and his government is in the process of scrapping environmental measures designed to control carbon emissions linked to climate change.